Still, is this at last the time? A few guideposts are handy. 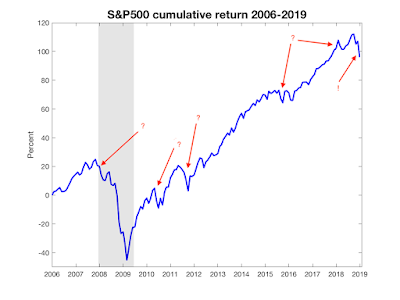 There is no momentum in index returns. None. A few bad months, or days, of stock returns are exactly as likely to be continued as to be reversed. The fact is well established, and the reason is simple: If one could tell reliably that stocks would fall next month, we would all try to sell, and the market would fall instantly to that level. Twenty percent volatility is normal. Twenty percent volatility on top of a 5 percent average return, means that every other year is likely to see a 15 percent drop. Big market declines come with a recession, as in 2008. But recessions are almost as hard to forecast as stock prices, and for much the same reason. They asked me to hold off a few weeks before posting the whole thing. So either wait two weeks or head over to The Hill. I also wrote here "The Jitters" related thoughts about the spring 2018 bout of volatility. 2. Imported goods, immigrant labor, and automation all tend to increase the unemployment rate. 4. Policy disputes over taxes and regulations are best thought of in terms of who gains and who loses. 5. Experts are smarter than the crowd. 6. Speculators make market prices more unstable. 7. Price gouging hurts consumers. 8. Rent controls help tenants. These myths are all widely believed by the general public. Our primary goal should not be to add new information, it should be to have people unlearn false ideas about the world. One is tempted to add to the list. (An invitation to comments.) Many of them stem from a basic principle -- "find the supply response" or ("demand response") that the fallacy ignores. "State the budget constraint" is another good habit. Look for competition, entry, and choice among alternatives -- a market is not just bilateral negotiation. I might add reverse causality and selection bias -- empirical economics has stories to tell as well. Scott frames the essay as a reaction to an Atlantic story advocating more teaching of behavioral economics. Scott is very clear: he is not opposed to behavioral economics. (He will likely be misquoted on this. Some behaviorists are very touchy. I know this from painful experience.) He is merely opining that our profession has more value added in teaching regular economics first. Regular economics is harder, less intuitive, less known, and therefore more valuable. To really understand behavioral economics, you have to understand what it is behaviorists object to -- and the vast amount of regular economics that good behaviorists agree with. Art schools might do better teaching people to draw, music schools to teach classical before atonal, physics programs newtonian before quantum mechanics, and so forth. Most people find the key ideas of behavioral economics to be more accessible than classical economic theory. If you tell students that some people have addictive personalities and buy things that are bad for them, they’ll nod their heads. And it’s certainly not difficult to explain procrastination to college students. [Dave Henderson's nomination for best sentence in the essay!] 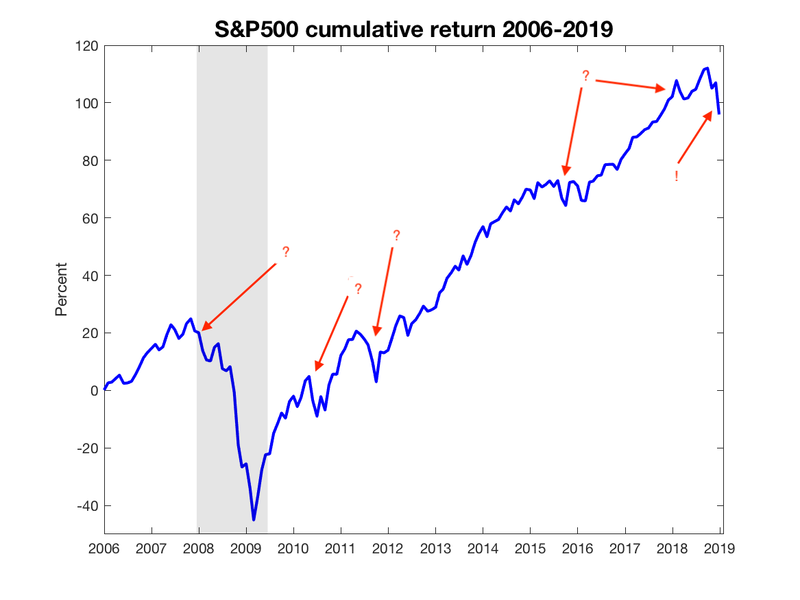 Ditto for the claim that investors might be driven by emotion, and that asset prices might soar on waves of “irrational exuberance.” ... One should spend more time on subjects that need more time, not things that people already believe. I.e. let us not indulge in our own quest for teaching ratings via confirmation bias. Yes, people do nutty things. But if you approach rent control, and all you have in the back of your head is behavioral stories, you will miss the clear prediction, borne out time and time again, that within a decade there will be a massive shortage of rental housing. That doesn’t mean that I agree with the way that economics majors are currently being taught. Our intermediate level courses are far too theoretical; they waste students’ time on lots of minor theories that would only be useful for people planning to do graduate work in economics. (Most students do not.) Too many homework problems with Cobb-Douglas utility, Hicksian demand, marginal rates of substitution, Giffen goods, gross substitutes, indifference curves, etc. Some of that is appropriate, but all economics courses should focus heavily on applied economics. Most students come out of such courses still unable to coherently judge Scott's nice list of fallacies. Most of our courses are histories of thought, "greatest hits" of past theoretical contributions, passed on rather mindlessly. We teach many harmful parables. For example, natural monopoly due to increasing returns to scale, and the need for resulting regulation is a staple, passed down from about 1910. It has little to do with modern industrial organization in a global economy. In part, it's easy to get through an hour by moving the curves around. Teaching real applied cases is much harder. Macroeconomics teaching is in worse shape. Keynesian macro, like behavioral economics, enshrines most people's intuitive fallacies. Consuming more will increase output - forgetting the budget constraint. Breaking windows is good as it gives employment to window repair people. Good Keynesian macro justifies these apparent fallacies with carefully described "frictions," by which classical economic results fail. But you have to understand those classical results first to arrive at a correct economics that recognizes frictions (like behavioral biases) but doesn't violate budget constraints and accounting identities. Most macro teaching consists of young professors pushing IS-LM curves around, though such curves appear nowhere in their own research, nor anyone else's since the time they were born. Well, it passes the time easily. An important point is implicit. Economics is not hard because of math. The math in even graduate level economics is no greater than in sophomore physics. Classical economics is hard because it can attack social problems in a value-free, cause-and-effect way, and upends the little morality stories that most people use to think about those problems -- rents are high because landlords are greedy. "Learning to think like an economist" is indeed best learned by application. And "learning to think like a behavioral economist" requires learning to think like an economist first. Christopher Rufo at the New York Post has an interesting article on homeless problems in Seattle. The analysis rings true of many other areas, especially San Francisco. It is also a good microcosm of how policy and law in so many social and economic areas stays so profoundly screwed up for so long. The real battle isn’t being waged in the tents, under the bridges or in the corridors of City Hall, but in the realm of ideas, where, for now, four ideological power centers frame Seattle’s homelessness debate. I’ll identify them as the socialists, the compassion brigades, the homeless-industrial complex and the addiction evangelists. My emphasis. And the political influence of groups organized around absurdly counterfactual narratives is the larger picture of this story. Socialist Alternative City Councilwoman Kshama Sawant claims that the city’s homelessness crisis is the inevitable result of the Amazon boom, greedy landlords and rapidly increasing rents. The capitalists of Amazon, Starbucks, Microsoft and Boeing, in her Marxian optic, generate enormous wealth for themselves, drive up housing prices, and push the working class toward poverty and despair — and, too often, onto the streets. ...According to King County’s point-in-time study, only 6 percent of homeless people surveyed cited “could not afford rent increase” as the precipitating cause of their situation, pointing instead to a wide range of other problems — domestic violence, incarceration, mental illness, family conflict, medical conditions, breakups, eviction, addiction and job loss — as bigger factors. ...the evidence suggests that higher rents alone don’t push people onto the streets. Even in a pricey city like Seattle, most working- and middle-class residents respond to economic incentives in logical ways: relocating to less expensive neighborhoods, downsizing to smaller apartments, taking in roommates, moving in with family or leaving the city altogether. King County is home to more than 1 million residents earning below the median income, and 99 percent of them manage to find a place to live and pay the rent on time. To be clear, that response does not imply everything is hunky-dory in Seattle's (or San Francisco's) housing market. The point is narrow -- high rents do not cause people to live on the streets. The compassion brigades are the moral crusaders of homelessness policy. Their Seattle political champion is City Councilman Mike O’Brien,... O’Brien has become a leader in the campaign to legalize homelessness throughout the city. He has proposed ordinances to legalize street camping on 167 miles of public sidewalks, permit RV camping on city streets, and prevent the city’s homeless-outreach Navigation Teams (made up of cops and other workers) from cleaning up tent cities. But according to King County’s own survey data, only 7.5 percent of the homeless report working full-time, despite record-low unemployment, record job growth and Seattle’s record-high $15 minimum wage. The reality, obvious to anyone who spends any time in tent cities or emergency shelters, is that 80 percent of the homeless suffer from drug and alcohol addiction and 30 percent suffer from serious mental illness, including bipolar disorder and schizophrenia. More rigorous academic studies in San Francisco and Vancouver suggest that 40 percent to 50 percent of the homeless moved to those cities for their permissive culture and generous services. public consumption sites do tremendous damage to businesses, residents and cities at large. It also attracts more homeless to a city. Last time I was in San Francisco, as we were entering a restaurant a half-clothed man was shooting up heroin on the four foot wide sidewalk just in front of the restaurant. I feel for the problems this man must have been facing, and the terrible life he leads. But San Francisco's policies are not a functional response, either to his problems, or those of a city where this is a normal part of life. Chris doesn't offer easy solutions, nor do I. The best way to prevent homelessness isn’t to build new apartment complexes or pass new tax levies but to rebuild the family, community, and social bonds that once held communities together. Homelessness should be seen not as a problem to be solved but one to be contained. Cities must stop ceding their parks, schools and sidewalks to homeless encampments. In San Diego, for instance, city officials and the private sector worked together to build three barracks-style shelters that house nearly 1,000 people for only $4.5 million. They’ve moved 700 individuals off the streets and into the emergency shelter, allowing the police and city crews to remove and clean up illegal encampments. In Houston, local leaders have reduced homelessness by 60 percent through a combination of providing services and enforcing a zero-tolerance policy for street camping, panhandling, trespassing and property crimes. There’s nothing compassionate about letting addicts, the mentally ill and the poor die in the streets. The first order of business must be to clean up public spaces, move people into shelters and maintain public order. The latter is the heart of Chris's point. The former seems sensible, and I have heard good superficial reports of similar programs. Still, I'm skeptical. One trip to a public toilet is enough to convince you of the difficulties of renting any kind of apartment to people who are struggling with mental illness and drug addictions. Didn't we just close down housing projects all over the country? Plus, we are infatuated with building new housing. The easiest way to get cheap housing is to move wealthy people out of older houses by letting them build new. And this too is the sort of thing that really has to be done at the state level. If one city does too good a job, it will only attract people to move there and make its job harder. Today's post though is not about exactly what policy is best to solve this tough problem. Most of all, I am struck by Chris' insight about how really dysfunctional policies persist through the repetition of these fairy-tale narratives. The current policy dysfunction is pretty clear. A WSJ oped with J J Plecs, formerly of Roam Analytics, which does a lot of health related data work. This is the full oped now that 30 days have passed. The previous blog post has a lot of interesting updates and commentary. The discovery that cigarettes cause cancer greatly improved human health. But that discovery didn’t happen in a lab or spring from clinical trials. It came from careful analysis of mounds of data. Imagine what we could learn today from big-data analysis of everyone’s health records: our conditions, treatments and outcomes. Then throw in genetic data, information on local environmental conditions, exercise and lifestyle habits and even the treasure troves accumulated by Google and Facebook . The gains would be tremendous. We could learn which treatments and dosages work best for which people; how treatments interact; which genetic markers are associated with treatment success and failure; and which life choices keep us healthy. Integrating payment and other data could transform medical pricing and care provision. And all this information is sitting around, waiting to be used. So why isn’t it already happening? It’s not just technology: Tech companies are overcoming the obstacles to uniting dispersed, poorly organized and incompatible databases. Rather, the full potential of health-care data analysis is blocked by regulation—and for a good reason: protecting privacy. Obviously, personal medical records can’t be open for all to see. But medical-data regulations go far beyond what’s needed to prevent concrete harm to consumers, and underestimate the data’s enormous value. Most of us have seen how regulations kept medicine in the fax-machine era for decades, and how electronic medical records are still mired in complexity. It’s tough enough for patients to access their own data, or transfer it to a new doctor. Researchers face more burdensome restrictions. “Open Data” initiatives in medical research, which make medical data freely available to researchers, are hobbled by Health Insurance Portability and Accountability Act (HIPAA) regulations and data-management procedures that reduce the data’s value and add long lead times. For example, regulations mandate the deletion of much data to ensure individual privacy. But if the data are de-identified to the point that patients can’t possibly be distinguished, nobody will be able to tell why a given patient experienced a better or worse result. HIPAA “safe harbor” guidelines require removing specific dates from patient data. Only the year when symptoms emerged or treatments were tried can be shown. So which treatment was tried first? And for how long? Was the patient hospitalized before the treatment or three months later? All of a sudden, the data aren’t so helpful. Health-care data released for public use are also closely hemmed in. For instance, Medicare prescription data are censored if a doctor wrote 10 or fewer prescriptions for a particular drug. That means whole categories of usage and prescribers are systematically missing from the publicly available data. Regulators need to place greater weight on the social value of data for research. Data use can be limited to research purposes. Specific dangers, rather than amorphous privacy concerns, can be enumerated and addressed. The Internal Revenue Service seems to have figured out how to keep individual-level tax data private while allowing economic researchers to study it. Similar exploration is needed for health data; the opportunity cost of medical discoveries not made is too high to ignore. Research consortia or governmental agencies can release patient-level data sets, including high resolution on symptoms, treatments, lab test-results and medical outcomes, but with names and identifying details anonymized. It should be freely available to researchers first for conditions with the most serious need for new insights, such as Alzheimer’s, ALS or pancreatic cancer. These can be the leading edge for which regulators develop data-control systems they can trust. Laws and regulations can stipulate that patients’ medical data can’t be used for nonmedical and nonresearch purposes such as advertising. Patients can be explicitly protected against any harms related to being identified by their data. Data couldn’t be used to deny access to insurance, set the cost of insurance, or for employment decisions. Patients should opt-in by default to share their medical records for research purposes, but always be able to decline to share if they’d like. Free societies have long benefited from a wise balance between the open exchange of ideas and information, and individuals’ rights and sensitivities. We need to get that balance right for medical data. Otherwise, societies less concerned with individual rights and privacy may seize the opportunities we’re giving up. Mr. Plecs is a consultant for the pharmaceutical and biotechnology industries. Mr. Cochrane is a senior fellow of the Hoover Institution and an adjunct scholar of the Cato Institute. More updates. In addition to to Roam, Tafi, Datavant and the FDA sentinel initiative mentioned in the previous blog post, a colleague points out Project Data Sphere which aims to "share, integrate, and analyze our collective historical cancer research data in a single location." It also mixes a wide variety of data sources, and makes data available to academics. Over the last few weeks we have had a series of discussions at Hoover on the 10th anniversary of the financial crisis and recession. This all happened mostly due to the energy of John Taylor. The final event on Friday Dec 7 was a Panel Discussion Summary, including Taylor, Shultz, Ferguson, Hoxby, Duffie, and myself, with question and answer. Click the above video. This was preceded by four smaller discussions. We did not video them, but there are transcripts and presentation materials. October 19, The causes. (Follow links to a transcript and to the presentation slides.) John Taylor and Monika Piazzesi present and learn discussion on the causes of the financial crisis, emphasizing monetary policy, regulation, and housing. November 9 The Panic What happened on in the panic of August through November (or so) 2018? Did the actions of government officials help or hurt? Or both? George Shultz and Niall Ferguson present their views and lead the discussion. December 7 also, Lessons for Financial Regulation. Darrell Duffie and me. Darrell summarizes his excellent "Prone to Fail." I expound on the need for more capital. What's distinctive about this series, given all the other conferences and retrospectives? First, we decided not to have retrospectives from people in power at the time. Many other such meetings are descending into memoirs of how we saved the world. Maybe they did, maybe they didn't. And maybe that's not so interesting, except of course to the parties involved who would like to go down nicely in history. Second, you will find an effort to trace the intellectual lessons of the last 10 years of thought, not just whether certain actions were right or wrong in context of some eternal truth. We all have learned a great deal in the last 10 years, and opinions are shifting. For example, I discuss how capital, once thought immensely costly and regulation much prefereable, has slowly emerged as not at all costly and the best salve for financial crises. Similar lessons have emerged throughout. Third, and perhaps most importantly, you will find here many disagreements with the standard narrative and what is becoming the first draft of history, as Ferguson nicely described. No, maybe it wasn't just "greed" and "deregulation." No, maybe our officials contributed to panic as much as they helped to stop it. 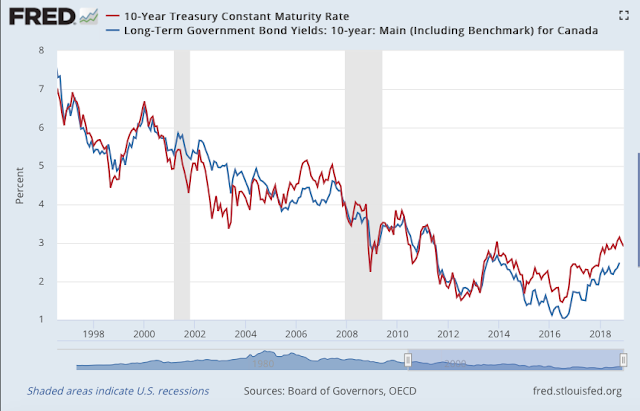 No, maybe fiscal stimulus and QE did not save the world. No, maybe our super-confident regulators armed with an immensely larger rule book are not ready to save the world again next time. And in each case you will hear contrary views buttressed with facts and thoughtful analysis. Perhaps when the second draft of history is ready to be written this will be a starting place. Corey Garriott, Sophie Lefebvre, Guillaume Nolin, Francisco Rivadeneyra and Adrian Walton at the Bank of Canada have issued a thoughtful and crisply written proposal for restructuring Canadian government debt, titled Alternative Futures for Government of Canada Debt Management. Why? Well, a simpler and smaller set of securities would be more liquid. There is a social benefit as well. We hear a lot about "safe asset shortage," and the need for liquidity. Well, the easiest way to create safe liquid assets is to make the safe assets more liquid! So many of humanity’s core problems — addressing climate change, improving education, boosting innovation — ultimately have the same structure as “fixing Brexit.” It’s just that these other problems come in less transparent form and without such a firm deadline. We face tournament-like choices and perhaps we will not end up doing the right thing. ...Brexit would likely cost the U.K. about 2 percent of GDP, a fair estimate in my view. But that is not the only thing at stake here. Humanity is on trial — more specifically, its collective decision-making capacity — and it is the U.K. standing in the dock. I guess I have a different view of the merits and defects of democracy. My view is somewhat like the famous Churchill quote, "democracy is the worst form of Government. Except for all those other forms." Democracy does not give us speedy technocratically optimal solutions to complex questions revolving around 2 percentage points of GDP. Democracy, and US democracy in particular, serves one great purpose -- to guard against tyranny. That's what the US colonists were upset about, not the fine points of tariff treaties. US and UK Democracy, when paired with the complex web of checks and balances and rule of law protections and constitutions and so forth, has been pretty good at throwing the bums out before they get too big for their britches. At least it has done so better than any other system. 2 percentage points of GDP? Inability to tackle long run issues? Let's just think of some of Democracy's immense failures that put the Brexit muddle to shame. The US was unable to resolve slavery, for nearly 100 years, without civil war. Democracies dithered in the 1930s and appeased Hitler. The scar of Vietnam is still festering in US polarization today. On the continent, when France stood for democracy and Germany for autocracy, France's defense decisions failed dramatically in 1914 and 1939. And if we want to raise UK GDP by 2 percentage points, with free-market reforms, there is a lot worse than Brexit simmering on the front burner. A team from Cato and Hoover could probably raise GDP by 20 percent inside a year. If anyone would pay the slightest attention to us. Yes, Brexit is a muddle which nobody will be happy with, until the UK decides if it really would rather remain or become a free-market beacon on the edge of the continent. But do not judge democracy on it. Democracy's errors as the mechanism for collective decision-making capacity have been far worse. And then there are the failures of all the other options. In preparing a presentation on QE, I stumbled across the following fact. 2) Use vs. Canadian 10 year government bond rates were nearly identical in the QE period. Conventional wisdom states that US QE lowered interest rates by 1%. I am a skeptic, and this graph reinforces my skepticism. 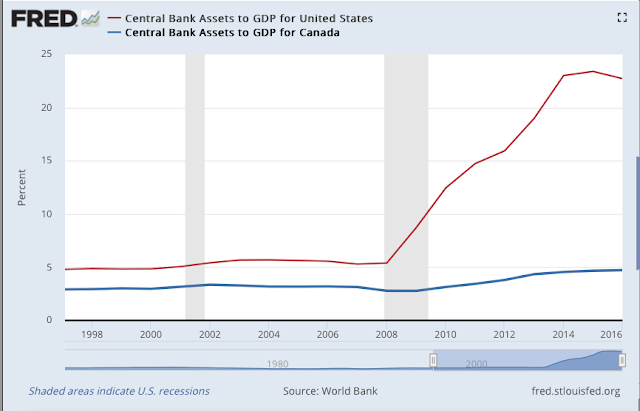 One might say that the US exports its monetary policy effects to Canada. But the Canadian Dollar is its own currency, so exchange rates, not interest rates should soak up that difference. One can complain in many ways, but this seems to me to add to the view that QE didn't even change interest rates. Equally, while some US companies might earn more profits operating in China [IP sharing requirements] and some job displacement in American manufacturing due to Chinese state subsidies may have occurred, it cannot be argued seriously that unfair Chinese trade practices have affected US growth by even 0.1 per cent a year. Larry gives more voice to China critiques than I do, which is excellent. One should listen to what people are saying, understand their objectives, and if one disagrees on outcomes -- tariffs -- usually it is because one believes a common objective has a preferable means of achievement. I wrote a little commentary on trade for The Hill, which they titled "The US should give China Flowers not Tariffs." Chocolates too. Trump and Xi met, and declared a 90 day cease fire. Where will this end? It’s hard to forecast. Our commander in chief is less predictable than the stock market. But we can opine on what should happen. And we can look for interest — what is in everybody’s interest to have happen? That answer is clear: Come to a quick deal, declare victory, and get back to work fixing real economic problems. China makes some commitments about intellectual property (reasonably good for both sides, though not as important as all the fuss makes it seem); China makes some promises to buy American goods (crony capitalist mercantilism, but it makes politicians feel good); the US announces the 25% tariffs are off the table. Both politicians announce a great triumph. In sum, roughly what happened with NAFTA. Better still, we could do some reciprocal opening: repeal the 25% tariff on pickup trucks, and our own restrictions on foreign investments. Large additional tariffs would be terrible for the US economy. Tariffs are taxes. Traditionally anti-tax Republicans, fresh off a hard-won victory to lower corporate taxes, should get that. And these taxes are starting to bite. For just one example, GM’s decision to close car plants was not completely unaffected by the price of steel and aluminum needed to make cars. And the constant threat of tariffs is in some ways worse than tariffs themselves. Companies managing global supply chains need to know where and how to invest. Big uncertainty postpones those investments. The point of the corporate tax cut was to encourage companies to invest. The threat of tariffs undoes that incentive. Big tariffs, with exemptions granted on a discretionary basis, are corrosive to our political system. The rest of the admirable deregulatory effort is trying to get government agencies out of this racket. If it ever was true that China stole our jobs, that’s not today’s problem. With a 3.9% unemployment rate, employers can’t find enough qualified workers. Our economy needs efficiency and productivity to grow, not protection for some and high prices for others. The US economy is doing well, but it’s an iffy time. When does the long expansion end and the next recession come? Storm clouds are gathering. The stock market is dribbling down. Auto sales, home prices and sales are softening. America remains waist-deep in debt. With split government, there will be no significant economic legislation legislation for the next two years, and the House will do everything they can to stymie the deregulation effort. A big disruption of trade and immigration is a self-inflicted wound at a bad time. It’s an even iffier time for China. Be careful what you wish for. A major downturn in China, which could well lead to financial crisis, could be just the spark for a global recession. What’s the long run goal? The right approach to trade is simple: zero tariffs or restrictions. Americans are free to buy from the cheapest and best supplier. Whether foreigners put in tariffs or not is irrelevant to that conclusion. Trade is no different than new companies that can produce things cheaper or better. And just as hurtful to old companies and their workers, but we generally see that it’s unwise to stop innovation. Trade between countries is no different than trade between states, and we all recognize that tariffs between states are a terrible idea. Any money that goes to China to buy goods must — must, this is arithmetic, not economics — come back. It just comes back to a less politically favored industry. To the extent that trade is “imbalanced,” that means China works hard, puts goods on boats, and takes our government bonds in return. Would we really be better off if we worked hard, put the fruits of our labor on boats, in exchange for Chinese government bonds? Paper and promises are cheap. If China wants to tax her citizens to subsidize goods for US consumers, the right answer is flowers, chocolates and a nice thank-you card, as you would for any gift. Even intellectual property protection is an iffy cause. Theft is bad. But if selling the technology isn’t worth the market access, US companies don’t have to do it. Moreover, much intellectual property protection is the right to just the kind of continuing profits that we bemoan at home, in the new worry about increasing monopoly. Just how enthusiastic are we about defending pharmaceutical companies’ right to charge whatever they want in the US for their intellectual property? If one wants to help the US economy, effort is far best spent at home — fix health care, financial regulation, the obscene tax code, zoning, occupational licensing, labor laws and on and on. The rewards are infinitely larger than any imaginable benefit from trade threats. US GDP per capita is $60,000. China’s is $9,000. The average American is more than six times better off than the average Chinese. The air in Beijing is unbreathable. For the US to complain about China hurting us is like the captain of the football team complaining that a six grader cheated him out of lunch money. Even in the best case, tariffs and trade restrictions are zero sum — they make the US better off by making China worse off. There is no case that they increase the size of the pie. In fact they make us all worse off. Is this America’s place in the world? Would we send in the marines to take wealth from Chinese people to benefit Americans? That’s the case for tariffs. The idea that we can use tariffs to threaten China into freer trade is dangerous. It’s hard to credibly threaten to do something that hurts us, without denying that it does hurt us, and then getting trapped doing it. It took decades to get rid of the trade restrictions of the 1930s. We should get a grip, set a standard for good self-interested free-trade behavior, and work with our allies to get China to obey the same rules. Such a China is far more likely to cooperate on security issues than one already at war with us over trade. I left out lots of obvious pot shots. An obvious one: Sanctions on North Korea, Iran, Cuba, Russia, and so forth are designed to.. reduce imports. So we are doing to ourselves exactly what we are doing to them.